The Pay section allows paying your online orders to e-shops which have as payment option M3Pay. These shops are in partnership with Moneymailme application. After you have chosen this payment option, a web page is available with a QR code to scan in order to execute the actual payment of the order. 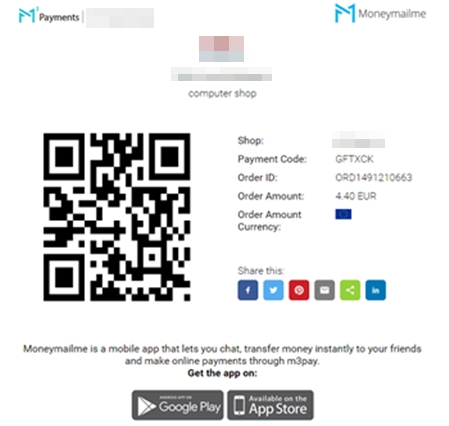 Note that this web page can be shared on social networks, so any person having the Moneymailme application can do the payment in your place. Go to the Pay section of your mobile phone in order to initiate an order payment; to do so, press on the $ sign on the right bottom of your screen. This will open your camera. 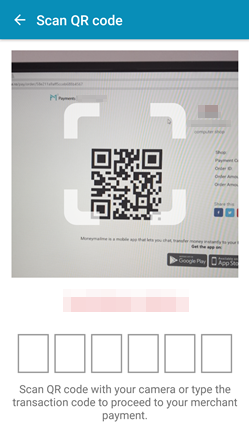 Hold the camera towards the QR code in order to make an automated scan; if the scan does not work, you can always input the payment code manually in the designated area. 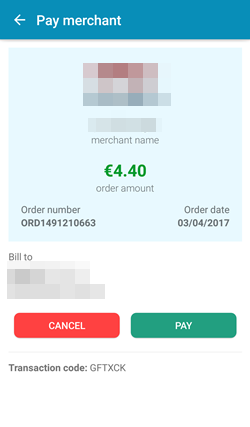 Before the actual payment, you will be input with a screen with the details of the order, to confirm or deny the actual payment. The payment confirmation requires the input of the security code you have received at account registration. Note: If you have forgotten the security code or lost the email containing it, follow steps as explained in Change security code section. After payment, you can view the transaction in your Transactions list. Note: Order payments are transactions on your wallet. See Transactions section for more details.